"The Jungle Fullback" is the 52nd Mandrake Sunday story. The story was written by Lee Falk and drawn by Phil Davis. The star fullback of "The Tigers" have sprained his ankle, and the big game is a week off. Lothar passing by and toss a ball back over the fence and "The Tiger's" got themself a new sensational barefooted giant fullback; "The Jungle Fullback". But some gamblers trying to disturb the game. "The Tigers", a big league pro football team. "The Warriors", a big league pro football team. 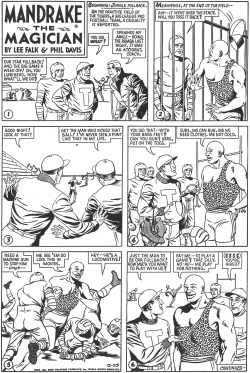 The story title is from the strip of December 21, 1951 (Next Week: The Jungle Fullback) and December 23, 1951 (Beginning: Jungle Fullback). This page was last edited on 20 June 2018, at 18:37.